SeaWorld is all about connecting humans with marine life. At Discovery Cove, SeaWorld's exclusive, limited-admission sister park, visitors can get really connected. Every guest is guaranteed hang time with dolphins, stingrays, exotic birds, and other creatures. But Discovery Cove's exclusivity comes with a steep admission price. Part water park, part SeaWorld attraction, part hands-on, real-life adventure, Discovery Cove offers a unique respite from the typical theme park frenzy. With daily attendance capped at 1000, guests are free to snorkel in the simulated coral reef, float around the tropical river, and explore the lush 33-acre park without being elbowed or waiting in any lines. Groups of no more than six swim and play with the dolphins, ensuring guests one-on-one quality time with the animals. Although it may sound like an oxymoronic phrase, Discovery Cove is a boutique theme park experience. Its amenities and level of service resemble a posh resort more than a bustling park. At about four times the going rate for theme park admission, the fee for all of this exclusivity is not insignificant. You'll know that this is not your average day in the theme park as soon as you pull into Discovery Cove. Veering away from the throngs queuing at SeaWorld's entrance plaza across the street, guests can choose valet parking or self-parking in the relatively cozy lot. They register in a spacious welcome center that looks like an upscale hotel lobby. Well-appointed bathrooms off the welcome center include individual cloth hand towels. Inside the park, the bathrooms double as locker rooms and include stall showers, oversized terry towels, blow dryers and other features you might expect to find in a fancy spa. "Adventure guides" lead guests from the welcome center through a nature walk where they might encounter sloths, anteaters, and other land animals. The guides also provide a lay of the land and show guests the cabanas to which they will report at their assigned times for the dolphin swim. Clearly, dolphins are the star attraction here. Three lagoons each accommodate four "pods" of six guests, three trainers, and the dolphins. Each group of guests spends approximately 30 minutes petting the dolphins, learning hand signals, being pulled by the animals' dorsal fins and cavorting with the friendly creatures. 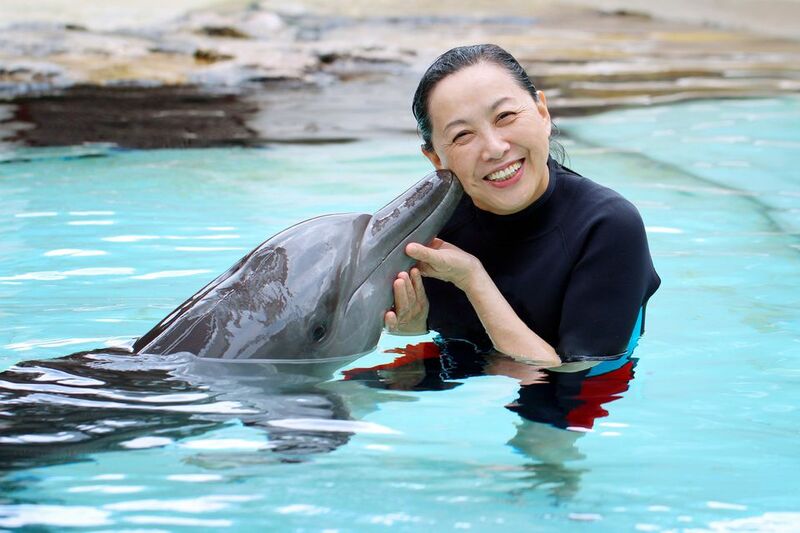 (If you're into it, you could even get a "kiss" from one of the dolphins.) Similar programs in Key West, Hawaii, and other locations are popular, but none are as elaborate as Discovery Cove's. Guests can jump into another pool and swim with stingrays. (Discovery Cove handlers routinely clip the animals' stingers, so you'll have nothing to fear beyond the stingrays' slimy exteriors.) There is also an aviary with 300 exotic birds. Some eat out of guest's hands. Guests can walk into the aviary or swim in via the river. Waterfalls at either end of the river entrances keep the birds inside. The highlight, of course, is the dolphin experience. The simulated coral reef, with its explosion of tropical fish and colorful grottos, is another highlight. Wind-Away River’s lush landscaping takes the concept of a lazy river to a whole new level. A huge aviary allows lots of interactive opportunities with colorful birds. Although they are not nearly as intriguing as dolphins, it's nonetheless fun to cavort with the ancient creatures in Stingray Shallows. The Grand Reef is teeming with marine life and another great place to explore. Virtually everything is included in admission to Discovery Cove, but the park does offer some add-on experiences for additional fees. These include: SeaVenture, an underwater tour of the Grand Reef made possible by using modified diving helmets; private 90-minute Animal Trek tours offer behind-the-scenes peeks and up-close encounters with the park’s birds and land animals; a swim-with-sharks experience for especially adventurous guests; an opportunity to feed the rays; and an exclusive experience shadowing a dolphin trainer for a day. Get a load of this: All food and drink is included with general admission to Discovery Cove. That includes all-you-can-eat servings for breakfast and lunch. The park offers hot and cold dishes for breakfast, served cafeteria style. For lunch, visitors have their choice of entrees such as fish or chicken, burgers, salads, and more. Tempting desserts such as cheery cheesecake cap the meal. If you’ve ever dreamed about getting unlimited refills at an Icee machine, Discovery Cove would fulfill your wish. You could also sample cookies, fruit, and other goodies for between-meals noshing. In addition to soft drinks, adults can imbibe on alcoholic beverages—all at no extra charge. The all-inclusive price includes swim and snorkel gear, lockers, sunscreen, towels, and virtually everything else you’d need to enjoy a day at the park. It also includes unlimited dining. As outlined above, Discovery Cove does offer upcharge experiences, but the included activities could easily fill a day of fun. In addition to the add-on experiences, you could spring for private cabanas, which include relaxing lounge chairs and hammocks, private lockers, and a host that acts as both a butler and a concierge. Advance reservations are required. Popular times fill up, often weeks in advance, so make your plans early. Reduced price non-dolphin swim passes are available. Discovery Cove is not included with admission to the adjacent Aquatica water park or SeaWorld Orlando; however, all Discovery Cove tickets include 14-day passes to SeaWorld, Aquatica, and Busch Gardens Tampa. This is a great value for visitors planning to visit all four parks. Children and adults pay the same price. Ages 2 and under are free. Operating Schedule: The park is open year round. The pools are heated and are therefore comfortable on cool winter days. Discovery Cove opens on rainy days. For tropical storms and hurricanes, the park closes and will reschedule or refund tickets. Location: International Drive in Orlando, Florida, adjacent to SeaWorld Orlando. Directions: From Orlando: I-4 W to Exit 72, From Tampa: I-4 E to Exit 71. Staying on property: The Renaissance Orlando Resort at Sea World is one of Central Florida's finest hotels. Its rooms are unusually large, its decor is striking, and it offers one of the best breakfast buffets in the area.